Pope St. John Paul II proclaimed in his 1978 Christmas Day homily that "the human being is single, unique, and unrepeatable, someone thought of and chosen from eternity, someone called and identified by name." If anything, the sacrament and vocation of marriage are so deeply personal: it is a singular person we are drawn to in marriage, a specific love with which we honor and serve that person, and a mirror of the Father's reckless, divine pursuit of each individual human heart. Lauren Santos, the artist behind the watercolor, print, and hand-lettering shop When Beauty Met Truth, invokes this reverence for the person, and for Love himself, in her work. 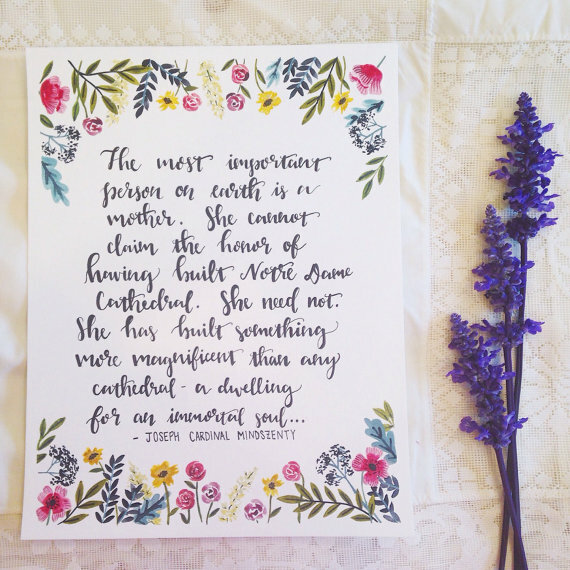 Combining words from Scripture, the saints, and literature with gorgeous calligraphy and florals, it's hard to imagine someone in your family or wedding party who wouldn't love one of her images as a Thank You gift--we're particularly smitten with the designs she's created for mothers. But in our opinion, the best gems of all lie in Lauren's custom work, which goes far beyond simple monograms or names. Her wedding dress sketches, bride and groom portraits, and family recipe art each preserve something so personal, so particular to you as a couple, and are cherish-worthy pieces. The artist has a special relationship to beauty. In a very true sense it can be said that beauty is the vocation bestowed on him by the Creator in the gift of “artistic talent.” And, certainly, this too is a talent which ought to be made to bear fruit, in keeping with the sense of the Gospel parable of the talents (cf. Mt 25:14-30). When I read this I was immediately struck by those words. God was talking to me in clear, unmistakable terms. I suddenly knew what my vocation was. My vocation was beauty! This is what God has called me to do! Not on the side or something to do until something better came along but to give my entire self to it!